If you’re looking at CNC machines, or machine tools in general, heavier is better. That old drill press or mill made of a few hundred pounds of cast iron isn’t just better because it’s stood the test of time for a hundred years — greater mass equals less vibration. Thanks to modern epoxy resins, we now have a replacement for tons and tons of iron. Epoxy granite, or chips of granite bound together with epoxy resin, is a viable and very good base for CNC machines, mills, and other tools that are served well with a ton of mass. [Joerg Beigang] is building his own CNC router, and he’s building the base out of epoxy granite. Here’s how he’s doing it. Before you pour epoxy into a mold, you’ll need to figure out how you’re going to attach your ways, linear rails, and ball screws. [Joreg] is bolting these parts to pieces of aluminum he cut on his home made panel saw before carefully drilling and tapping them to accept the linear rails. These aluminum plates were then mounted to the bottom panel of the mold, in this case melamine-coated plywood. As you would expect, the most intricate part of this build isn’t globbing up a mold with epoxy resin. No, the real trick here is making sure the rails of the CNC are aligned perfectly before the epoxy goes in. This was done by bolting the linear rails to the mold box and checking everything with a dial indicator. Once that was done it was time to pour. The bed itself is made of 18kg of epoxy granite, with the entire pour done in four batches. The best way to settle a big pour of epoxy granite is through vibration, just like concrete, but it looks as though [Joreg] is getting some good results by tamping it down with a few sticks. You can check out the first part of this build series below. If we’ve captured your interest, it’s worth reminding you that this isn’t the first epoxy granite CNC machine we’ve featured. It seems like only yesterday that the Linksys WRT54G and the various open source firmware replacements for it were the pinnacle of home router hacking. But like everything else, routers have gotten smaller and faster over the last few years. The software we run on them has also gotten more advanced, and at this point we’ve got routers that you could use as a light duty Linux desktop in a pinch. But even with no shortage of pocket-sized Linux devices in our lives, the GL-USB150 “Microrouter” that [Mason Taylor] recently brought to our attention is hard to ignore. Inside this USB flash drive sized router is a 400 MHz Qualcomm QCA9331 SoC, 64 MB of RAM, and a healthy 16 MB of storage; all for around $20 USD. Oh, and did we mention it comes with OpenWRT pre-installed? Just plug it in, and you’ve got a tiny WiFi enabled Linux computer ready to do your bidding. On his blog [Mason] gives a quick rundown on how to get started with the GL-USB150, and details some of the experiments he’s been doing with it as part of his security research, such as using the device as a remote source for Wireshark running on his desktop. He explains that the diminutive router works just fine when plugged into a USB battery bank, offering a very discreet way to deploy a small Linux box wherever you may need it. But when plugged into a computer, things get really interesting. If you plug the GL-USB150 into a computer, it shows up to the operating system as a USB Ethernet adapter and can be used as the primary Internet connection. All of the traffic from the computer will then be routed through the device to whatever link to the Internet its been configured to use. Depending on how you look at it, this could be extremely useful or extremely dangerous. For one, it means that something that looks all the world like a normal USB flash drive could be covertly plugged into a computer and become a “wiretap” through which all of the network traffic is routed. That’s the bad news. On the flip side, it also means you could configure the GL-USB150 as a secure endpoint that lets you quickly and easily funnel all the computer’s traffic through a VPN or Tor without any additional setup. We’ve seen all manner of hacks and projects that made use of small Linux-compatible routers such as the TP-Link TL-MR3020, but we expect the GL-USB150 and devices like it will be the ones to beat going forward. Let’s just hope one of them doesn’t show up uninvited in your network closet. With so many WiFi home automation devices on the market, you might want to take advantage of these low cost products without having to send your data to third-party servers. This can be accomplished by running your own home automation hub on your home network. If you don’t want to use a full computer for this purpose, [Albert] has you covered. He recently wrote a guide on running Domoticz on the $20 GL-MT300Nv2 pocket router. The setup is rather simple: just perform a firmware update on your router using the provided image and a full home automation stack is installed. Domoticz provides a web interface for configuring your devices, setting up rules, and viewing sensor data. The pocket router is also supported by OpenWrt and provides a USB host port, making it a low-cost option for any WiFi hack you might have in mind. We’ve seen quite a few OpenWrt based hacks over the years. Many Hackaday readers will be settling back into their lives after a holiday period crammed into some family matriarch’s house along with too many assorted relatives, having given up their speedy internet connection for whatever passes for broadband wherever Granny lives. The bargain-basement router supplied by the telephone company will have spent the period wilting under the pressure of a hoard of teenagers watching other teenagers inanities on YouTube, and the Christmas ritual of Resetting The Router will have been performed multiple times. 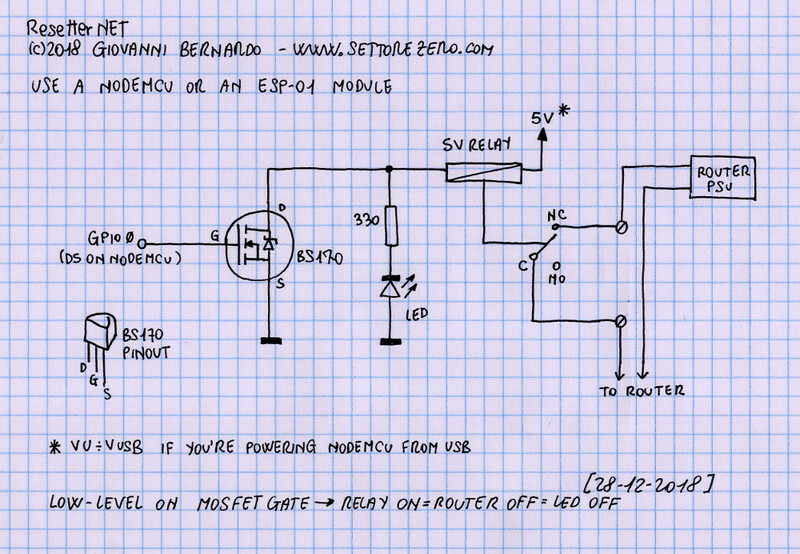 A very simple schematic for the resetter. Wouldn’t it be nice if your router simply reset itself every time it crashed or the Internet connection went down? [Cyb3rn0id] has a solution (Italian original here), in the form of an ESP8266 that pings an online service every few seconds, and turns the router off and on again via a power relay in the event that the ping attempt is repeatedly unsuccessful. It’s brilliantly simple, requiring only a single GPIO and a MOSFET to fire the relay with an LED indicator for good measure, and it’s built upon a piece of prototyping board. The router power is switched on the low-voltage side for safety. The software is pretty basic and has the WiFi credentials hard-coded into it, so we’re guessing a version with a web interface could be built. But as a personal device for easing the pain of router crashes it gets our vote despite that shortcoming. This isn’t the first router resetter we have seen here, but a previous model still required human intervention. Before we had Raspberry Pis and Beaglebones, the art of putting a Linux system in a small, portable project was limited to router hacking. The venerable WRT54G controlled Internet-connected robots with a careful application of a Unix-ey firmware. Now, things are different but there’s still a need for a cheap, portable Linux system that’s just good enough to get the job done. Now, there’s an upgrade to the board that follows in the footsteps of that router hacking The Onion Omega2 Pro is up on Crowd Supply, and it’s got more buttons, more switches, and it’s still smaller than a breadboard. The Onion Omega2 Pro is a slight upgrade over the breadboard-friendly SoM launched a few years ago. The Pro version features a 580 MHz MIPS CPU, 512 MB of RAM (Update: this is 128 MB physical RAM and 384 MB flash swap file), 8 GB of storage, and connectivity with b/g/n WiFi. Unlike the previous version, this is a far more functional system with a 30-pin expansion header, support for battery charging, a micro USB for charging and serial, and a USB host port. Because this is at its heart the guts of a router on a development board, you also get all the fun of WiFi networking. The expansion header connects to various add-ons including a GPS module, OLED display, and an Ethernet port. Now we have Raspberry Pis and other various boards based on smartphone Systems on Chip, but sometimes you don’t need that much overhead. You don’t need weird Linux distributions dealing with ARM bootloaders. Sometimes you just need something simple, and the Onion Omega2 Pro does just that. The type of CNC machine within the financial reach of most DIYers is generally a three-axis affair, with a modest work envelope and a spindle that never quite seems powerful enough. That’s not to say that we don’t covet such a machine for our own shop of course, but comparing small machines with the “big boy” five-axis tools might leave the home-gamer feeling a tad inadequate. Luckily, there’s a fix that won’t necessarily break the bank: adding a fourth axis to your CNC router. [This Old Tony] tore into his CNC router – a build we’ve featured before and greatly admire – to add a machine spindle that lets him work with the machine much as if it was a CNC lathe. The first video below covers the mechanical part of the build, which involves welding and machining a sturdy assembly to hold a spindle connecting a four-jaw chuck to a Lexium MDrive, a stepper motor with integrated driver and feedback that makes it act more like a servo. [Old Tony] covered integrating the drive into Mach4 in a previous video. The assembled machine spindle is a beefy looking affair that can smoothly ramp up to 3000 rpm and has decent enough holding torque to allow it to act as an indexing head in addition to a lathe. The second video below shows some tests turning aluminum and steel; we were surprised by how aggressive the cuts can be before stalling the spindle. No, it’s not a Tormach or Haas or even a Pocket NC, but it’s a great addition to an already capable machine, and we’re looking forward to what [Old Tony] cranks out with it. If it’s stupid and it works, then it’s not stupid. There’s no better evidence of that than [Tobias]’ networking setup. He recently had to distribute Ethernet through a building, and there are a few ways to do that. You can use regular ‘ol twisted pair, or fiber, but in this case running new cables wasn’t possible. WiFi would be the next obvious choice, the distance was just a bit too far for ‘regular’ WiFi links. Ethernet over power lines was an option, but there are amateur radio operators in the house, and they put out a bunch of interference and noise. The solution was to mis-use existing 75 Ohm satellite TV coax that was just sitting around. The correct way to do this would be to use a standard DOCSIS modem and become your own cable Internet provider. The equipment to do this is expensive, and if you’re already considering running WiFI over coax, you’re too deep down the rabbit hole to spend real money. 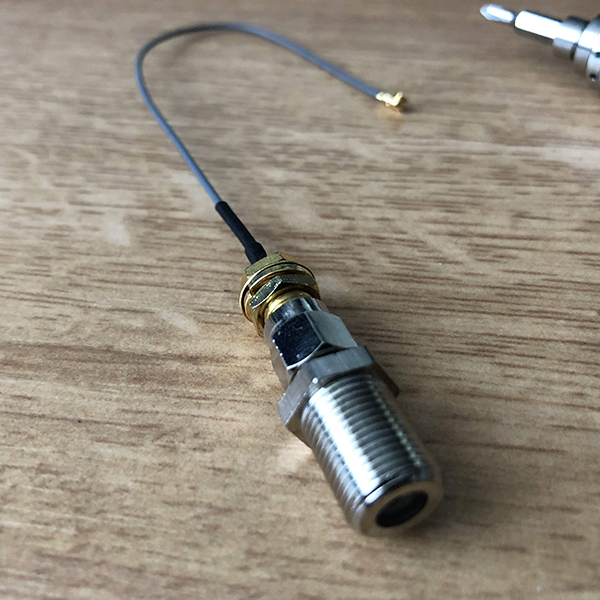 Instead, [Tobias] simply made a few u.FL to F-connector adapters from u.FL to SMA, then SMA to F-connector adapters. There are some problems with this plan. WiFi is 50 Ohms, TV coax cable is 75 Ohms. Only one MIMO channel will be available meaning the maximum theoretical bandwidth will be 433 Mbps. WiFi is also at much higher frequencies than what coax is designed for. With two WiFi antenna to coax adapters, [Tobias] simply connected the coax directly to a router set up to bridge Ethernet over WiFi. The entire thing worked, although testing showed it was only getting about 60 Mbps of throughput. That’s not bad for something that was cobbled together out of old parts and unused wiring. Is it surprising that this worked? No, not really, but you’ve probably never seen anyone actually do it. Here’s the proof it does work, and if you’re ever in a bind, this is how you make WiFi wired.